Welcome to a new CLO column, US Chess League Highlights by Kostya Kavutskiy of the LA Vibe. Kostya will be zeroing in on some of the most exciting moments of each USCL action packed week. For full league info you can go to uschessleague.com or watch the games on the Internet Chess Club. Don't agree with Kostya? Post a comment, but be nice. Unlike the official USCL Game of the Week competition, these picks are just for fun. Week 5 was an extremely competitive week in the USCL, as out of eight matches, three were drawn, and four more yielded a winner through a score of 2.5-1.5, the slimmest decisive margin. The biggest story of the week was the upset by the Chicago Blaze over the Arizona Scorpions. Although the strength of the teams was balanced, Arizona was the only team with a perfect record coming into this week, and had a 4-0 record against the Blaze, making many to expect that they would continue both streaks. However, the Blaze stepped up, with GM Dmitry Gurevich and NM Eric Rosen scoring wins on boards 1 and 4, along with IM Florin Felecan who held a draw on Board 2. The San Francisco Mechanics got the best of the Los Angeles Vibe, and moved to 4-1 to solidify themselves, along with Arizona, as the team to beat in the Western Division. Chicago is comfortably in 3rd place in the standings and the St. Louis Archbishops round out the playoff teams with an even record. In the East the New England Nor'easters continued their dominance over the division by defeating the Philadelphia Inventors, 2.5-1.5, with a lone win by FM Braden Bournival on board 3. New England moves on to a stellar 4.5-0.5 record, followed by the 4-1 New York Knights, who won 3-1 over the Baltimore Kingfishers. In 3rd and 4th place of the playoff race is the 3.5-1.5 Boston Blitz and the 2.5-2.5 Baltimore Kingfishers. GM Joel Benjamin of the New Jersey Knockouts is currently the MVP leader at the season's halfway mark with 14 MVP points (See his CLO piece on the league so far), but with five matches left there are a number of players who can overtake him for the MVP title. And now for some match highlights! This is a hard award to give out because honestly, every match is exciting. No two chess games are truly the same, so how could any 4-game match not hold its own surprises? Regardless of how tough it was to pick the most exciting match though, I ended up choosing Saint Louis vs. Dallas. 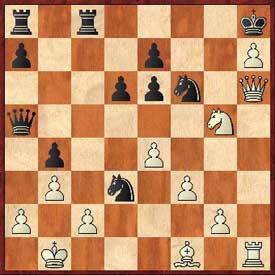 White won all 4 games in this drawn match, but what truly interested me was that each game started with more of a positional tone but was then decided in a complicated, tactical, final series of moves where indubitably all 8 players were in time-pressure. This fascinating struggle was covered by Spencer Finegold in the Saint Louis blog and can be read on the Chess Club and Scholastic Center of Saint Louis website. There were a lot of endgames to choose from, but the choice really wasn't all that difficult. 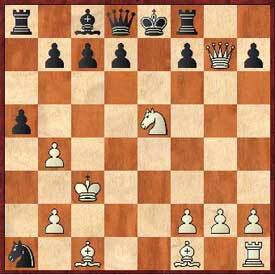 When two strong GMs reach an unbalanced endgame on move four, you know you're in for a treat. At first the imbalance in the position was simply a fianchetto for White and more central control for Black, but several moves later it shifted to the classic imbalance of the "two bishops advantage" for White, facing a much stronger pawn structure for Black. GM Benjamin did his best to open up the position for his bishops, and after trading one off the game shifted to a new imbalance-A better pawn structure for Black, but lots of activity for White. It seemed like Joel got the best of the complications, winning a pawn and correcting his pawn structure, but GM Christiansen fought back very well, and simply went after White's kingside pawns with his own king and knight. The game ended in a draw after White was forced to sacrifice his bishop for a strong passed pawn and was left with a rook and two connected passed pawns against a rook and knight, a material imbalance where neither side could really press for a win. For more on GM Joel Benjamin in the US Chess League, see his recent CLO blog, Garden State Blues: GM Joel on the USCL. But Felecan found the very pleasing 21...Qxa2+!, and after 22. Kxa2 Black can force a perpetual check with 22...Rxc2+ 23. Kb1 Rc1+ 24. Ka2 Rc2+ 25. Ka2 Rc1+, etc. 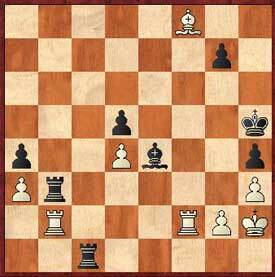 FM Zaremba played 53...Rxh3!, and regardless of which way White chooses to recapture the rook, the game will end with Rh1#. That's it for this week! Check back here every week for USCL highlights. Follow all Week Six action live on the Internet Chess Club and find pgn downloads, line-ups, blogs and Game of the Week details on uschessleague.com.